Fill out and sign a Petition for Dissolution of Marriage. The petition must include your name and address, the name and address of your spouse, the grounds for the divorce, and information on any minor children of the marriage. Along with the petition, you must file a Financial Affidavit; you may also file a Marital Settlement Agreement at this time, although it is not required. Fill out and file a fee-waiver petition simultaneously with the divorce petition. A fee-waiver petition is a document that specifically requests that the filing fee, which varies by court, be waived by the clerk, and that you be allowed to file the divorce petition free of charge. As grounds, you must assert that you are indigent and unable to pay the statutory fee. The fee-waiver petition can also request of a waiver of the sheriff's fees required for service of the petition on your spouse. Prepare an Affidavit of Indigency, in which you list your assets -- money, property and other goods -- as well as any income you derive from wages or non-wage sources, such as disability, unemployment compensation or workers' compensation indemnity payments. Each court has a blank form you can use for this purpose; some clerks provide the form online. Sign and date the petition and have it notarized before filing it with the Petition for Dissolution. 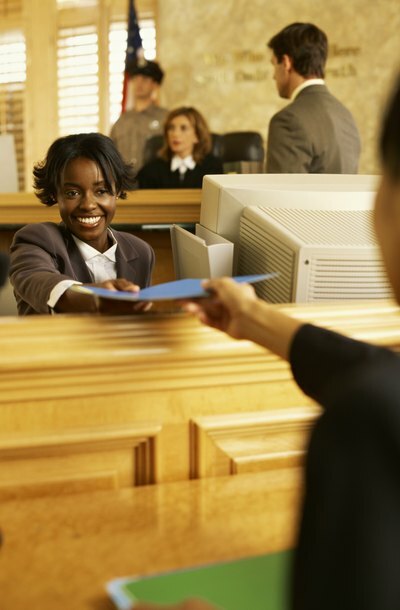 Attend a court hearing, if required by the clerk of court. At the hearing, the judge will review your paperwork and ask questions related to the Affidavit of Indigency that you filled out. You may have an attorney present. At the end of the hearing, the judge will either approve or deny the fee-waiver petition; if the petition is denied, you will have to pay the filing fee to the clerk before the clerk's office will process the divorce petition.